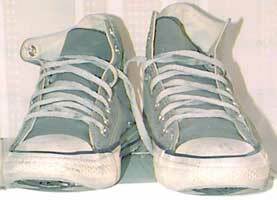 Converse Incorporated, of North Reading, Massachusetts, is the manufacturer of many different types of athletic shoes. 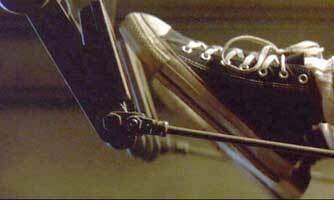 One of their products, the Chuck Taylor All Star, is a canvas basketball shoe. After owning many pairs of black high tops, I can say, without reservation, that Chuck Taylors are the best shoes in the world. The Converse Chuck Taylor All Star (often known simply as “chucks” or “All Stars”) never goes out of style. They have been manufactured since the 1932’s, and have not changed their design yet. They have been seen on the feet of millions of people, of vastly different backgrounds. Everyone from rockers to high school basketball players have worn them throughout their existence. Chucks were worn by athletes through the 1930’s and 1940’s, by baby boomers in the 1950’s and 1960’s, by NBA stars in the 1970’s, by musicians in the 1980’s, and by everyone in the 1990’s and beyond! The classic canvas and rubber design has proved so popular that about the only thing that Converse has changed over the years is the box they sell it in. Charlie, of Charlie’s Sneaker Page, raises the question, are chucks “The most popular sneaker of all time?” According to Converse, 550 million pairs of All Stars have been produced so far. I say they win the title. All Stars are great for driving. When I’m in my Peugeot, burning rubber, I need to be able to react fast. And since my brakes aren’t exactly perfect, I need to be able to react as quickly as possible. With boots or clunky Nikes on, my feet can’t feel the pedals. I only feel the padding inside the shoe. I do not feel one with my car. On the other hand, my chucks mold perfectly to the shape of the gas, brake, and clutch pedals. The rubber sole is just thick and firm enough to prevent puncturing, yet thin enough to bend to the shape of whatever I’m stepping on. So when I’m braking around a sharp turn, or hitting the gas to avoid a big semi, my All Stars keep me connected with the car, and with the road. My chucks go with anything. Of course this applies only to my black high tops, but that’s the only way to go when buying All Stars. I can wear them with Levi 501’s and a white T-shirt, and do my best James Dean impression. I can wear them with shorts and a jersey, and look stylish while playing a game of two on two. I can wear them to a fancy dinner with black slacks, white shirt, and black tie, and not look out of place. I can even wear them while swimming in a river, to keep my feet from being cut up by large rocks, then continue wearing throughout the day. They’ll dry in about ten minutes. Try doing that with your Air Jordans! Chucks are the shoe for any occasion. Everyone knows the true reason why chucks rule the world: They’re cheap! These shoes are a bargain! Short of buying imitation leather shoes at Payless Shoe Source, you can’t find a cheaper athletic shoe anywhere. They’re so cheap that for the price of a pair of Nike Air Jordan high tops, about $200, you could get yourself five pairs of chucks! You could get them in different colors and alternate daily, or mix and match for the Punky Brewster look. Let’s be honest. Who can afford $200.00 for a pair of shoes? Not me. Not you, reader, if you’re a student, or even a teacher. So why bother going to Nordstrom, putting the new Jordans on VISA, and running up a huge debt? Just click on the link below, and have a pair of All Stars delivered to your door! I don’t have to tell you any more. I could go on for days about other great features of the All Star. Features like, when they begin to fall apart, the toe box appears to have a mouth, which you can make “talk” by wiggling your toes. I don’t need to start on the All Star as a blank canvas (no pun intended) for your art. No doubt you’ve seen many grungy kids running around as of late with drawings and phrases written all over their mismatched chucks. Nope, I’ll just leave it at that, because by now you know that the Converse All Star is the best shoe in the world.